During the week of June 19 on the island of Crete, the first global Orthodox Council to meet in more than 1,000 years—known as the “Holy and Great Council”—brought together more than 290 delegates, mostly bishops, representing 10 self-governing local Orthodox churches. I was privileged to serve as an external correspondent of the Ecumenical Patriarchate’s Press Office, headed by Rev. John Chryssavgis. Together with other members of my team, I lived through the dramatic events leading up to the council and was present at some conciliar sessions. Perhaps the most significant achievement of the Holy and Great Council is that the bishops managed to meet at all, after decades of preparation and the last-moment attempt of four churches to stop the event. By meeting in a global council, the Orthodox churches proved to themselves and the rest of the world that they were not merely a loose confederation of local churches, but that they were also a unified body, historically continuous with the “one, holy, catholic and apostolic” church of the creed. The Christian communion that prides itself on being “the Church of the seven Ecumenical Councils” could henceforth not only profess conciliarity as its core ecclesiological principle, but also practice global conciliarity as an important dimension of its ecclesial life. 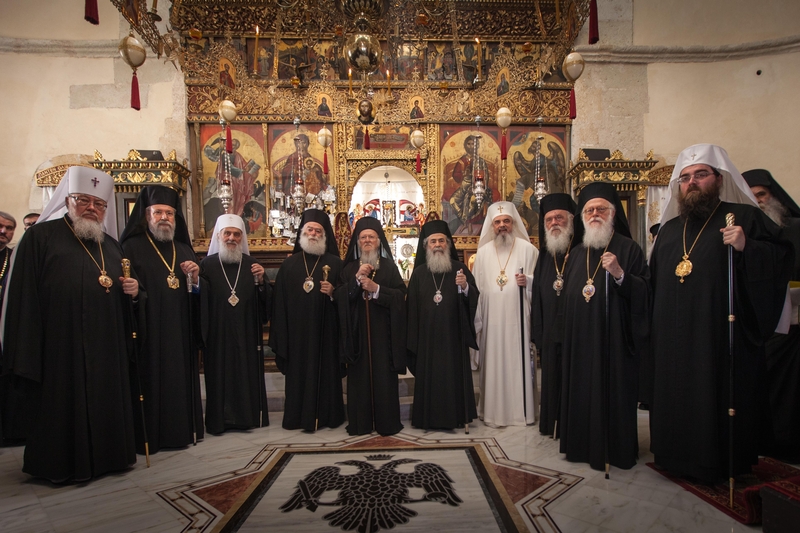 There is no obvious analogue in the modern history of Eastern Orthodoxy for the Council of Crete, but the ecumenical councils of the first millennium provided the main framework. The official name of the council, “Holy and Great,” was probably inspired by the four canons of the Council of Nicaea (325) that use the same terms in reference to the First Ecumenical Council. Similar to the Fourth Ecumenical Council, the Council of Crete began on the Feast of Pentecost, which fell on June 19 in the Orthodox calendar. The original plan was to carry out the conciliar meetings in the Church of St. Irene in Constantinople, where the second Ecumenical Council was held in 381. But due to the security concerns expressed by the Patriarchate of Moscow, the council was transferred to the Orthodox Academy of Crete. Most ecumenical councils of the first millennium were summoned by the Roman emperor and attended by the papal legates. The Council of Crete met in a new, postcolonial and post-totalitarian historical situation, marked by the Great Schism of 1054 (the division between Roman Catholicism and Eastern Orthodoxy) and the collapses of the Roman Empire, Ottoman Empire and Soviet Union, as well as the emergence of nation-states and the multiplication of autocephalous (self-governing) Orthodox churches. In the absence of an emperor or the pope, simply bringing all autocephalous churches together became a major challenge, given the forces that have been pulling Orthodox church leaders apart for centuries. The Council of Crete has been compared to a gathering of an extended family whose members have not met for a long time. While the overall atmosphere was orderly, irenic and open, the council was also marked by initial apprehensions and enduring tensions. The first significant tension was between the churches in the Hellenic sphere of influence—dominated by the Patriarchate of Constantinople, which occupies the position of “first among equals”—and the Slavic sphere of influence, dominated by the Patriarchate of Moscow, which is numerically the largest group. The Ecumenical Patriarch Bartholomew I was the council’s chairman and the main figure who patiently worked toward bringing as many local churches as possible together. For his part, Patriarch Kirill of the Russian Orthodox Church—while in principle supportive of the idea of the council—made unrealistic demands and applied pressure to other local churches in his sphere of influence to pull out of the event, perhaps fearing that his own status would be diminished by the council. The third significant force at Crete was a church that belongs to neither sphere of influence: namely, the Romanian Orthodox Church, whose head, Patriarch Daniel, has been one of the most vigorous supporters of the conciliar process. As a “neutral territory,” Romania could play an important role in future conciliar gatherings. The second significant tension was between those primarily preoccupied with the matters of canonical order and those who focus on mission. This tension became especially acute in the discussion of mixed marriages between Orthodox and non-Orthodox. The Georgian Orthodox Church, which absented itself from the council, previously expressed a strict position that all mixed marriages were invalid. Representatives of other local churches, especially those who shepherd minority Orthodox communities in the West and for whom mixed marriages are an everyday pastoral reality, spoke in defense of such marriages for the sake of mission. The third significant tension, which often paralleled that between the mission-minded and canon-minded, was between outward-looking and inward-looking styles of leadership. The most problematic type of an inward-looking Orthodox leader has fundamentalist sympathies and sectarian proclivities. Prior to the council, some Orthodox sectarians went so far as to claim that such an event was impossible in principle, would become an occasion for schism and even precipitate the coming of the Antichrist! While most Orthodox Church leaders did not take such apocalyptic scenarios seriously, the fundamentalist approach to the Orthodox tradition hung like a dark cloud over the council. The silence that followed this rhetorical question indicated that the vast majority of delegates were ready to disown an overly narrow, fundamentalist reading of the patristic tradition. A particularly strong weapon against the fundamentalist threats of schism is provided by the 22nd paragraph of “Relations of the Orthodox Church with the Rest of the Christian World,” which states: “The Orthodox Church considers all efforts to break the unity of the Church, undertaken by individuals or groups under the pretext of maintaining or allegedly defending true Orthodoxy, as being worthy of condemnation. As evidenced throughout the life of the Orthodox Church, the preservation of the true Orthodox faith is ensured only through the conciliar system, which has always represented the highest authority in the Church on matters of faith and canonical decrees” (Canon 6 of the 2nd Ecumenical Council). The condemnation of fundamentalism as incompatible with the Gospel is one of the most significant outcomes of the conciliar process. The condemnation of fundamentalism was a necessary step toward ecumenical and interfaith dialogue, since there was a considerable difference of opinion on the matter. The conciliar process was a vehicle for synchronizing the ecumenical “watches,” so to speak. More broadly, the conciliar process has unleashed a positive, unifying dynamic that was not present in the Orthodox world before. The leaders of the local Orthodox churches that skipped the council and remained in “splendid isolation” will now face the necessity of assessing eight documents that the council authorized without their participation. Six of these documents—on mission, fasting, autonomy, Diaspora, marriage and ecumenism—have been discussed for decades by all churches and were passed by the council with only minor amendments. The absentee churches would find it hard to make convincing arguments against these documents, which their leaders had previously endorsed and which they could have amended had they had come to the council. This means the Council of Crete has unleashed centripetal forces that decrease the chances of isolationism in the future. Perhaps the strength of the Orthodox Church could be made perfect in the weakness of its central administration. Unlike the head of the Roman Catholic Church, no Orthodox primate can make a conciliar decision universally binding by virtue of his own authority. In Orthodox ecclesiology, such authority belongs to the bishops gathered at a Pan-Orthodox Council, as long as their decisions are properly received by the people of God. We are only at the initial stages of such a reception. We will find out whether the Council of Crete is truly “Holy and Great,” or merely a prelude to something holier and greater, and perhaps something that will eventually involve other Christian churches in the years ahead.